Boil the sweet potatoes until tender. When done, drain them and mash with butter, salt and pepper to taste. Set aside for later. In a sauté pan heat the oil over a medium heat and gently cook the onion, carrot and celery until soft. (The onion should look golden and translucent). Add the garlic and sprigs of rosemary and cook for 2 minutes until really fragrant. Spoon the veg into a bowl and set aside. Turning up the heat take the same sauté pan and add remaining oil. Brown the beef. Then pour in the wine and bubble it up hard until the alcohol burns off. Crumble in the stock cube add the water, tomato purée and tabasco sauce stir them in well. Season with salt and pepper. Add the vegetables without the rosemary and mix in with the meat. Stir well and cook for 5-7mins to allow flavors to amalgamate. Heat the oven 200°C. 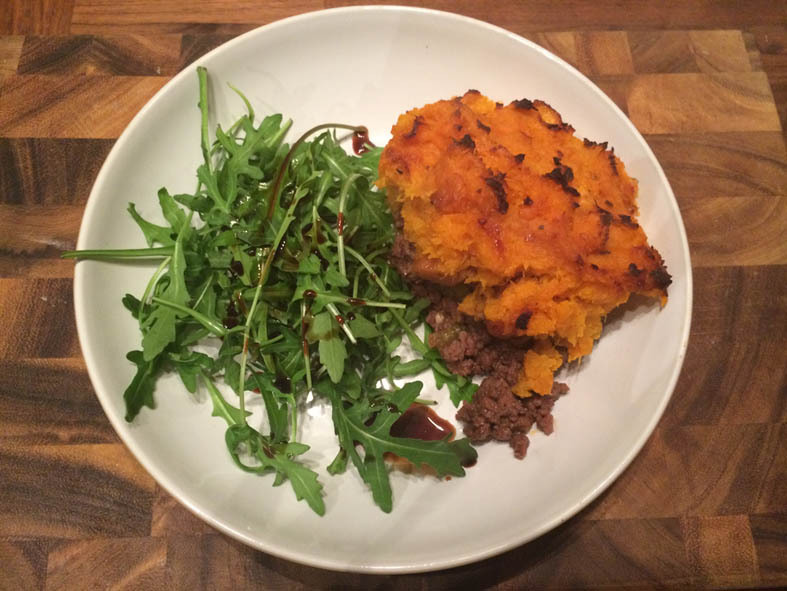 Tip the meat and veg mixture into your pie dish and cover with the mashed sweet potato scoring with a fork. Dot with extra butter and bake for 45 minutes, or until brown and crispy on top. Serve with fresh rocket salad drizzled with balsamic vinegar. I hope you enjoy it, we love it in our house it’s real healthy comfort food. Give it a go and let me know what you think. Please share this recipe with your family and friends.